Infrared Therapy — Tranquility Wellness Center, Inc.
Celluma delivers blue, red and near-infrared light energy simultaneously to safely treat a wide variety of conditions. Each wavelength is absorbed by different molecules that act as a signaling mechanism for different cellular processes. The Hot House and Chi Machine radiates a gentle, invisible, healing frequency that deeply penetrates and slightly elevates body temperature. The resulting stimulation is in harmony with the body's own heat generation and internal processes, providing benefits that have been found to be helpful for many health conditions and overall well being. Sweating is good for you. It is the body’s safe and natural way to heal and stay healthy. Infrared Sauna’s heat the body directly, causing a rise in core temperature. This results in a deep, detoxifying sweat at the cellular level, where toxins reside. Light Emitting Diode (LED) phototherapy is the application of light energy to tissue to obtain therapeutic benefits. The energy is used to improve cellular performance. Phototherapy is known for its healing and anti-inflammatory properties and has a variety of applications across many medical fields. Research has shown that phototherapy can: increase circulation, accelerate tissue repair, decrease wrinkles, decrease inflammation, improve skin tone, texture and clarity, ease muscle and joint pain, stiffness, spasm and arthritis and kill acne bacteria, and much more. The benefits of the Hot House’s Far Infrared Rays are Reduced inflammation, fibromyalgia, help with Crohn’s, irritable bowl syndrome, arthritis, relieves stress and much more. Steam from boiling water can heat the skin but it doesn’t heat the internal organs. Yet, sunlight heats us in a profound way because it contains penetrating far-infrared rays, as well as the full range of energy in the electromagnetic spectrum. The Chi machine, placed on your ankles will increase circulation, strengthen your core and balance your Charkas. Chi blends the ancient arts with modern technology for a unique therapeutic massage experience. The Chi Machine maximizes the movement of the body which helps to provide prompt temporary relief through increased oxygen levels. Fatigue or excess physical exertion can generally lead to minor muscular aches, pain and tension. The Chi Machine supports temporary relief from these conditions without creating undue stress to bodily structures or additional muscular overexertion, while improving your circulation and organ function. Because the massage with The Chi Machine is performed while you are reclining and relaxed, with weight removed from the spine, a sense of extreme comfort and pleasure is immediate and noticeable.The combined use of both the Chi machine and the Hot House will burn 150 calories in 15 minutes! Low 100˚-200˚F. More of the vital far infrared light energy is emitted at a lower surface temperature. This leads to pain relief, better circulation, and more effective detoxification. Solocarbon® heaters do not use wires to conduct far infrared heat. We apply the perfect thickness of ultra conductive carbon to a fiberglass panel activated by positive and negative copper strips on either side. Then the panel of fiberglass and carbon are sealed by lamination. This means Solocarbon® heaters have NO UNHEALTHY GASES released during heating. Increasing the core body temperature is critical in achieving superior detoxification results. Solocarbon® heaters were tested and shown to consistently increase core temperature by a 3˚F rise in core temperature and increase heart rate over a 60 minute session (30 minute heat up and 30 minute cool down cycle). Continure to burn calories after your workout while you relax. 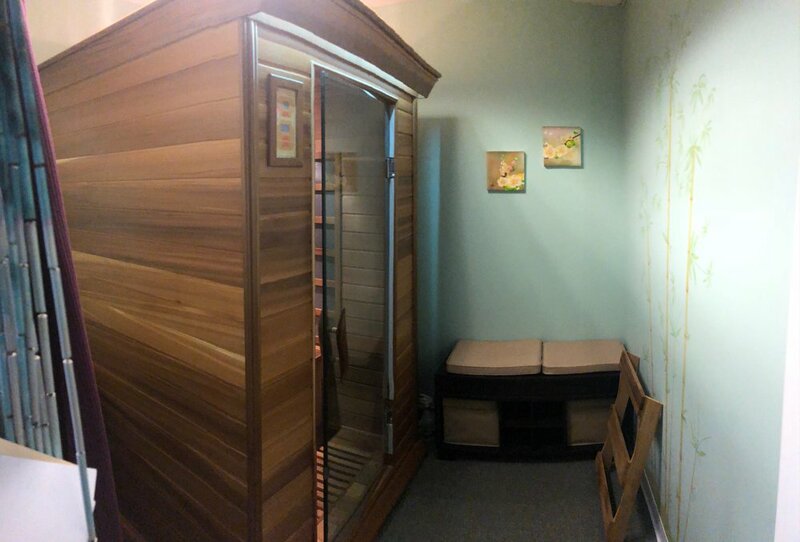 A 30 minute session in a far infrared Sunlighten™ sauna will enhance your ability to meet your weight loss goals. All sessions are by appointment only. Book online to see openings.